I have an adorable wee toddler, known as Duckling. He’s in daycare 3 days a week, and I get to entertain him on my own for 2 days a week. I’d like to know what free or very cheap things other parents are doing with small children! I’ll start: I made play dough for him, which is a lot of fun and only needs a handful of ingredients I keep on hand for baking anyway. He loves playing with his train set and driving his Lego dolls around, so I’m hoping to find some more for cheap in the local secondhand websites. We have a toy library nearby, and get a couple of toys every few weeks so he has a set of his own basic toys and then the fun and noisy stuff is rotated so we don’t get too annoyed by it! We also like going to the singalong time at the local library. I am also interested in this thread! My little wiggler is about to turn one! I like to take him to library storytime on Saturdays. I’m not sure it’s really his thing (yet?) but he does love all the space for crawling in the library. He loved just looking at other kids when he was smaller, and now I have to chase after him to prevent him from using other people to pull himself up to standing. Once he can stand on his own, I’m sure that will change to some other reason to chase after him. The library has toys available to check out. I’ve done that a couple of times, but he gets so many gifts from friends and family that I’m not sure it will ever be necessary again. My kiddo is launched but I’ve been helping a friend with her 3-kids-under-2 in the past couple of weeks and will for a few months. Her 22-month old LOVES anything outside, so it’s been very challenging this winter keeping her from getting super crabby being stuck inside all the time. We have an indoor arboretum that has been a regular outing for her and her dad. We also are super lucky in this area (Minneapolis) to have many museums that offer FREE passes we can check out through the public library. This program started when my son was in early school years so we didn’t use it much, but it’s amazing. My son’s favorite thing when he was little was to help with whatever we were doing. My big win was giving our kiddo a spray bottle of water and his own stack of rags to clean whenever and wherever he wanted, and a little dust pan and handbroom. That’s a really clever way to let him help! I’ve been meaning to make a little apron for my son so he can cook with me. DH is thinking of getting him one of the “learning towers” which are a stepladder with bars around it so he doesn’t fall out (I’m happy to risk falls off a dining chair). DS would love a little spray bottle, I’ll see if I can find one that’s easy for him to use. I meant to get a learning tower but then balked at the prices I saw. I think Ikea has a reasonably priced one if I remember rightly (no idea if it’s still reasonable in your neck of the woods) but we don’t have an Ikea near us, so we just got in the habit of using dining room chairs. If I’m to the left of the chair, the chair back is turned to the right. One thing I have found is putting a towel down helps keep the chair from sliding bit by bit when kiddo is leaning on the counter. It also helps when he’s “washing” the plastic dishes and getting some water on the floor. A favorite game when we would end up with multiple cardboard boxes from diapers/wipes was to stack up the empty boxes into a tower and then kiddo would knock them down. He’d also try to stack them up again but we usually had to help after 2-3 boxes. It’s all the fun of stacking blocks but the tower was even bigger than he was. Since the boxes came from different sources we could usually nest them when not in use, then after a while they’d go out to the recycling. My learning tower was $90ish on gumtree; one of the many many ones listed that is homemade by someone with basic woodworking skills. Ewok, 22 months, is currently home with either or both of his parents six days a week, and at his Grammy’s house one day a week (daycare will be two days a week starting sometime after mid-May). He gets taken for a walk to a park first thing in the morning at least five days a week, to play on the equipment, get a change of scene and run around in a bigger space than our garden. We do “hose time” in the backyard - running hose, paddle pool, a few toys suitable for water. Duplo is a real winner for us. Sensory play setups from Busy Toddler have been good, but not as big a hit as I expected - maybe when he’s slightly older? Other people swear by the library storytime session, but we’ve never made it to one. We do love our kindermusik classes (singing, dancing, playing with shakers) which we go to twice a week. I should add that kindermusik isn’t free or super cheap, but it works out to something like $10 a session which isn’t bad considering it’s his only paid activity. I’m home with Pikelet (24 months) 7 days a week but do get some help here and there from parents and in-laws and of course Mr Pancakes in the mornings/evenings and weekends. We joined two playgroups. I take her to one and her grandparents usually take her to the other. I enjoy these as there are different toys and activities as well as other kids, and importantly other parents. It costs $2 and an expectation that we help. Pikelet does ballet once a week. At that age it’s less ballet and more singing/music/dancing. This is the most expensive activity we do but she loves it. We go to the library once a week for their rhyme time. The library we go to has a professional children’s performer do the music with instruments and the whole lot. This is a highlight and also how I met most of my parent friends. This one is free. It’s also a train ride there and back which is exciting. We go the museum and/or art gallery at least once a week, after the library or ballet. Pikelet particularly likes drawing in the art gallery. They provide pencils and paper in the general areas or there are also kid specific areas where they run craft activities. These are free, though I do sometimes buy a season pass if there is a paid exhibit on. The park is a safe bet if the weather is good. I don’t go as often as maybe I should because Pikelet has an appetite for danger and the supervision requirements/stress levels for me are very high. Parks with water play areas are excellent in summer. If the weather is dreadful and she is climbing the walls a cafe with an indoor kids area is good. A babyccino (maybe just an Australian thing?) is cheap and I need coffee anyway. The change of scenery usually settles things. Painting is a favourite activity for home. Crayola washable kids paint does actually seem to wash out very well. We also do what Pikelet calls “mixing” which is a sensory bin of coloured rice, pasta, kitchen equipment, etc. Cotton wool, tongs and an egg carton are her favourites at the moment. She helps in the kitchen, especially any “mixing” or “tipping” that needs to be done and also washing up. We have just a standard Ikea wooden step stool rather than a learning tower but so far that seems adequate. We made Pikelet a little garden in a self watering pot. She takes care of it and loves watering the flowers with her watering can and picking the flowers. We have a proper yard now so I’m looking forward to doing gardening with her. The “mixing” activity sounds so simple and fun! 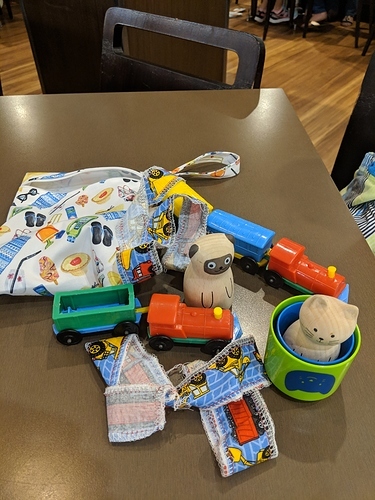 This seems like a good thread to ask in (assuming @LadyDuck is okay with a slight tangent): what reasonably-priced / good value toys or activities would you pack in a small backpack to entertain your toddler in non-child-friendly environments? Little Duplo or Lego set - one you keep stashed away so it’s super exciting when you bring it out. ‘Magic’ drawing or painting sets - the kind that just use water or a special pen. I have to entertain my toddler during a psych appointment on Friday, so perfect timing. Tiny hotwheels style cars seem good. A friend has a “quiet book” with little activities on each page like zippers, buttons, stuff that moves. The book is made of fabric or felt. I took a photo of our current traveling toy bag. Mini wetbags seen really good for this. I think we’ll put together an art one as well (stickers + pencils + paper). @ladyduck that’s a great use for those wetbags from pumping. Looking at them gives me PTSD but I should find a new use. Over here, wetbags are made with -may-* fabric by cloth nappy companies. I hadn’t thought of using them to transport (bags? Bottles?) of milk. If you have cute ones then giving them a new job is a good idea. Maybe swap some with a friend of your own ones remind you of pumping too much? what’s may fabric? Mine are not quite waterproof, but water resistant enough to transport used pump parts and bottles to and from in my purse. I think people use them for soiled clothing/cloth nappies, as well. Interesting, I have a couple for cloth diapers, but never thought to use them for pumping either!